Foam shredder ESF007C The machine is suitable for shredding foam wastes to articles of desired size, the size of the foam articles can be varied by changing the sift aperture diameters. Availlable sift aperture diameter: 8,18.30 mm. 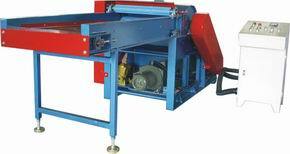 Predominance of the machine is that the shredding part can be maintained and changed with ease. HEAP HENG LEONG SDN BHD provides you with the widest varieties of upholstery materials for both furniture and automobile industries.